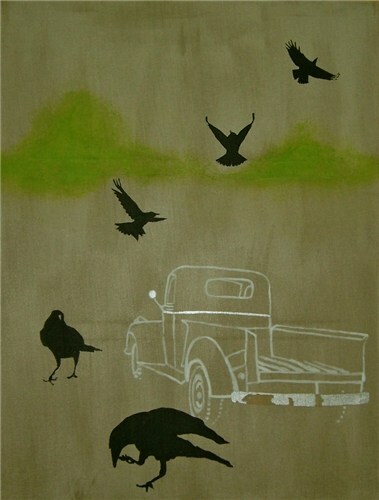 "Owl & the Rat Race"
I create contemporary oil paintings with collage on linen canvas and illustrations on paper. I invent visual narratives with paint, gold leaf and college relating to themes around nature, identity, travel, Japan and collections such as cabinets of curiosities. I only use the finest paint pigments to ensure the work will last thousands of years. The sandy coloured raw linen and any collage elements are fully protected with a clear primer which allows it to remain visible and a feature in this work. You can get a sense of scale of my paintings with the exhibition images of my artwork on the exhibitions page. Having grown up near historic Yorktown, Virginia in the USA on the coast I soon had a love and respect of nature and history. References to nature can be found throughout my work such as depicting antlers in paint in response to the growing concern the world is facing with regards to the environment. 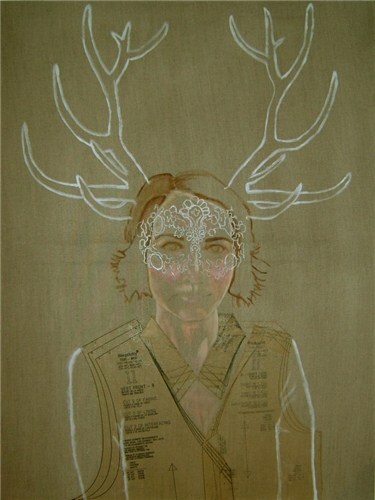 This nature and antler as a headdress on a girl theme is inspired by the Japanese fashion trend called Mori Girl. During my degree in Art History, I was recommended to train in France to learn the language and train my eye and hand in art and history. I remained many years training in art in Paris, where I studied figure drawing for three years with the ADAC studios with Master Artist M. Mathieu and a semester of oil painting at the L’Ecole du Beaux Arts, Paris. With limited space and gaining French nationality, Paris is where my interest in identity, travel and collections blossomed. These themes can be found throughout my artwork with references to zen, Japan and collections such cabinets of curiosities. It was there in Paris, I also saw exhibitions on Japanese art and how artists like the impressionists who had their own private collections were inspired by this art form as well. I enjoy travelling to Japan to see even more of the culture and art first hand. The Japanese tradition of calligraphy and zen can be found in my brushstrokes. The Japanese origami washi paper and marbled paper I use in my collage in my paintings bring a sense of pattern, texture, handmade craft, tradition and history to the work. I also appreciate the importance or sense of negative space or space between elements called Ma in Japanese culture and art. It is not only what you add but also what you choose to leave out that makes a seemingly simple artwork complex in the planning and execution process. The tactile nature of the paintings create an intimate space where viewer is drawn in to examine the different textures, depths and mixed media collage made of sand, paper and objects that project slightly out. Some of the collage elements in this work are personal and others have different layers of symbolic meaning depending on how the viewer interprets them. This participation of the viewer to connect with the work and create their own narrative based on the meaning they bring to the painting is what makes these different for everyone.